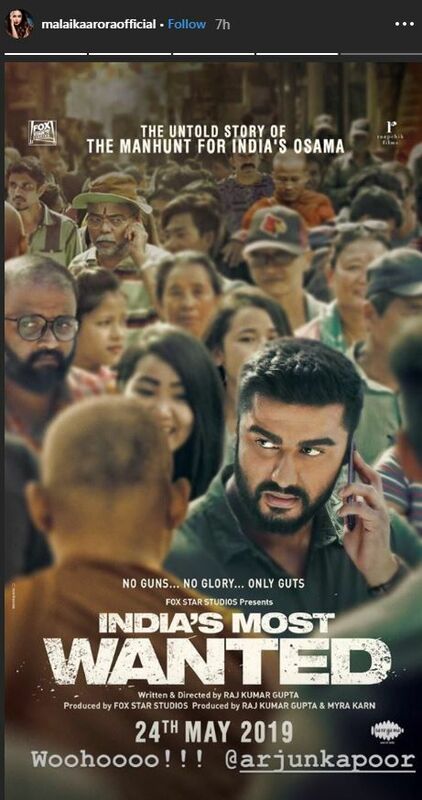 Malaika Arora cannot contain her happiness as rumoured boyfriend Arjun Kapoor drops the teaser of his film India's Most Wanted. Arjun Kapoor and Malaika Arora are currently the talk of the town with the dating and wedding rumours doing the rounds. Both the actors are not very vocal about their personal lives. Arjun recently released the teaser of his film India’s Most Wanted and after watching the trailer Malaika shared the poster of Arjun on Instagram. Rumours have been doing the rounds that Malaika and her Arjun will be tying the knot this month in Goa. Rumours also suggest that the couple has given strict instructions to the team to not reveal anything about the wedding and just focus on their work. Recently while speaking to Times of India, Malaika slammed all the rumours and called it ‘silly.’ She said, “There is no truth to these silly speculations”. Malaika and Arjun Kapoor were spotted a few days ago outside a hospital in Mumbai. The couple usually greets the shutterbugs but this once, they avoided the paps by walking away without a wave or a smile. Talking about India’s Most Wanted, it is a historical period drama based on true events. The film is a tribute to the unsung heroes of India. Arjun will be seen playing the role of an intelligence officer.